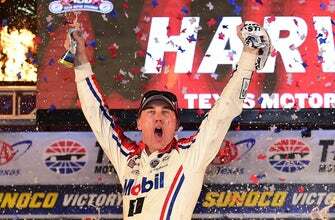 Kevin Harvick earned a shot at another NASCAR Cup championship, taking the lead over Ryan Blaney in overtime Sunday to win at Texas. Harvick led 177 of the 337 laps. Harvick opted to start from outside for the green-white-checkered finish. By time they got to the backstretch, Harvick pushed his No. 4 Ford in front and raced to his eighth win of this season. It is the second year in a row that Harvick, the 2014 Cup champion, won the fall race at Texas to get into the final four. Now the series goes to Phoenix next week with only two spots up for grabs for the championship run at Homestead in two weeks. Kyle Busch, a seven-time winner this year, and defending Cup champion Martin Truex Jr. are among the other six title contenders, and Clint Boywer, Aric Almirola, Kurt Busch or Chase Elliott could also advance with a win.